words can change a life. We don’t take that lightly. 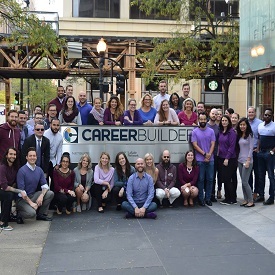 will continue to define what CareerBuilder is and where we’re headed. build a life – and a company – that works. From volunteering during work hours to diverse education opportunities, CareerBuilder is committed to helping employees strike a balance. Comprehensive Medical, Dental & Vision Programs. Education Reimbursement Program allowing up to $5k per year towards completion of a Bachelor’s and non-MBA graduate degree, and up to $10K per year towards completion of an MBA! No strings attached! Global Wellness initiatives to promote financial, mental, and physical health and well being. 401(k) Program with a two year vesting schedule, discretionary match, and an opportunity to make Pretax and Roth contributions.